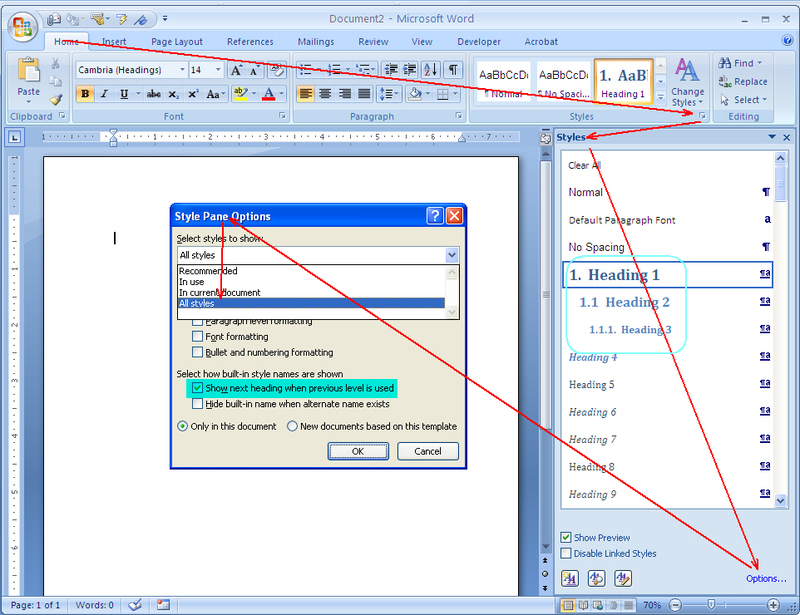 Creating and fixing multi-level numbered headings in Word might seem to be a bit tricky for the first time users. Nevertheless, if you know the correct procedure, it would be a piece of cake! Firstly, we will define the multilevel numbering for the heading levels using Multilevel List feature. 1. 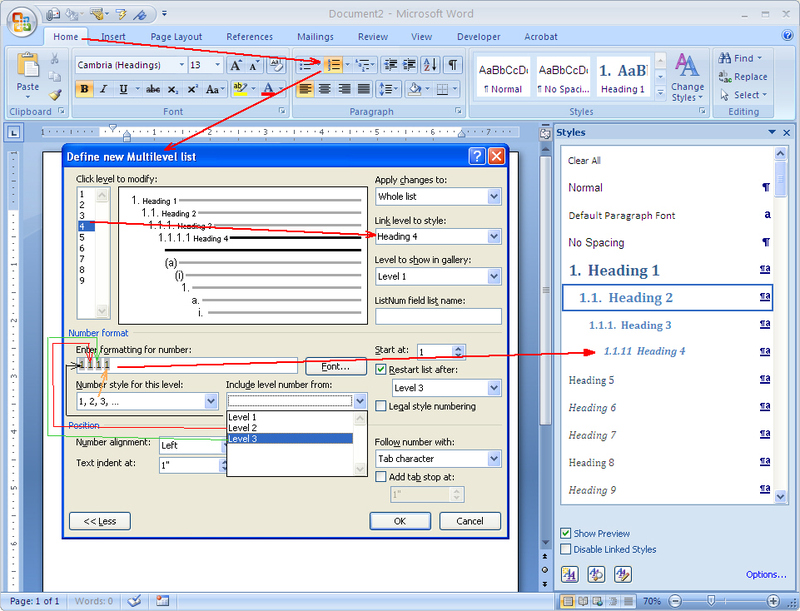 Open the Word document in which you want to apply numbered headings. 2. From the Word Ribbon menu, under the tab Home and within the group Paragraph, click the Multilevel List icon . A drop-down menu appears. 2. From the drop-down menu, select the option Define New Multilevel List (at the bottom of the menu). The “Define New Multilevel List” dialog box pops up. 3. Click the More button ( ) available at the bottom of the dialog box. The dialog box expands to show additional fields (see below image). 4. Click level “1” from Click level to modify selection box (on the top left hand side of the dialog box). 5. From the drop-down list named Link level to style, select “Heading 1”. This way, you are linking heading level “1” (that you will use in your document) to Word’s default Heading 1 style from the Styles gallery. Later, you can modify style for each heading as you wish. 6. In this step, enter a numbering format for your heading level 1 in the field Enter formatting for number from the drop-drop-down list Number style for this level. So, the format you select from the drop-down list will appear in the Enter formatting for number field. You can delete the default number format appearing in the Enter formatting for number field and choose your own. a. You can reset the value in the Enter formatting for number field by selecting a value from the spin box Start at. b. If you find the field Number style for this level as disabled, clear the check box Legal style numbering. 7. Similarly, select level “2” from Click level to modify selection box. 8. 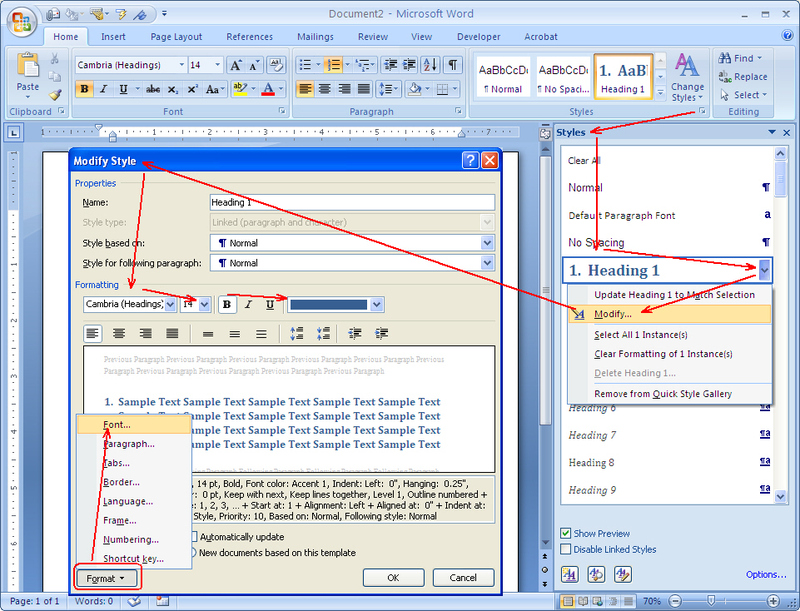 Link level 2 to Word’s default Heading 2 by selecting “Heading 2” from the Link level to style drop-down list. 9. Delete whatever appears (by default) in the field Enter formatting for number to apply a new number format. From the field Include level number from, select Level 1 (as a prefix) for the second level heading. Apply a dot (.) or anything you would like after the prefix number. I prefer a dot. 10. After a dot (. ), select a numbering format for the Level 2 heading (e.g. 1.1). You are done. 11. Similarly, you can keep adding levels as needed. While creating the third heading, select Level 1 and Level 2 headings as prefixes from the Include Level Number from field and then select a number format for the Level 3 heading (e.g. 1.1.1 ). The following example shows how to construct the Heading level 4. Once you are done with defining number format for all the headings, you can view the same being updated in the Styles gallery, under the tab Home, within the group Styles in the Ribbon. Or, you can open the Styles window by pressing Shift+Ctrl+Alt+S. Now, select text in your document (which you want as a heading) and then click the relevant heading style (which you have just created) from the Styles gallery. Please note that you may not see all the multilevel heading levels (that you have just created) in the gallery depending on the configuration of the Style Pane Options. You can open the Style Pane Options dialog box by clicking the Options link available at the bottom of the Styles gallery pane. See below image. The Style Pane Options window appears. Click Select styles to show drop-down list and select the option All Styles from the list. Click OK. Now you can view all the 9 heading levels with multilevel numbering in the Styles gallery. You can modify the style (font, numbering, etc.) of the headings from the styles gallery by selecting Modify from the right-click menu of each heading and then clicking the button from the Modify Style dialog box. For example, if you want your Heading 1 to have font “Cambria”, font size “14”, Bold, color Blue then configure these in the Modify Style dialog box as shown in the following screenshot. You can also apply these style by clicking the Format button available at the bottom of the Modify Style dialog box and then clicking the Font from the sub-menu. This will display the Font dialog box where you can apply font styles for Heading 1. Similarly, you can modify other properties of the headings by selecting the appropriate options from the Format sub-menu. Please let me know in the comment section if you have any difficulty understanding the procedure or if you have any other queries, suggestions, etc. I will be more than happy to help you out! Thank you.